Oral cancer screening check ups should be a routine part of a patient’s dental maintenance. Regular check-ups, including an examination of the entire mouth, are essential in the early detection of cancerous and pre-cancerous conditions. Tiny, white or red spot or sore anywhere in the mouth. A lump, thickening, rough spot, or crust. A sore that bleeds easily or refuses to heal. People who are at greater risk for oral cancer include users of tobacco in any form, people who consume heavy amounts of alcohol combined with smoking, people over the age of 40, and those who have prolonged exposure to the sun (lip cancer). Patients who fall into this high risk category should have an annual ViziLite Plus exam in combination with a regular visual examination. 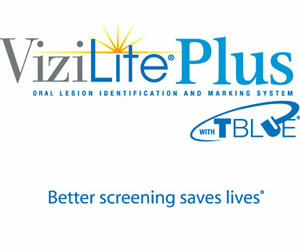 ViziLite Plus uses technology that helps the dentist identify soft tissue abnormalities that may develop into cancer. The ViziLite Plus exam is painless and fast. First, the patient will be given a mouth rinse solution. The dentist will then dim the light and examine the patient’s mouth using a specially designed light wand. If any suspicious tissue is detected, a biopsy can be performed.